A long while ago, I reviewed the Perplexus by Michael McGinnis, and at that time, it was a day or two before the release of two new puzzles in the Perplexus line, the Perplexus Rookie and Perplexus Epic. It's been quite a while, and I've had them for some time, so I figured it was about time to review those two new puzzles. 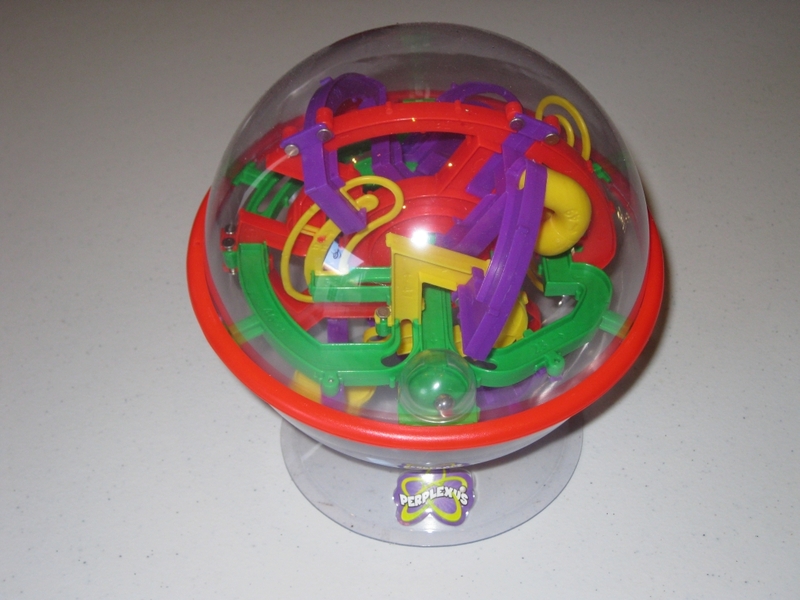 The first of two reviews will look at the simpler version, the Perplexus Rookie. Much like its bigger brother the Rookie sticks to bold bright colours which will appeal to a younger audience, however it is a little smaller than the original at 6.5" diameter. It also has less checkpoints from start to finish with only 70 stages. Again, unlike its bigger brother, there's only one entry point to the maze rather than three, which certainly hints at this being a simpler version. I'd certainly agree that this is much more of an introductory puzzle, and I was able to make it from the start to the end after only two attempts. Much faster than I was able to complete the original Perplexus! Despite the simpler nature, it's still a very fun puzzle, and I have to admit that I really enjoyed solving it. Since solving it initially, I've gone back and resolved it a number of times, which really is the mark of a good puzzle. The end of the puzzle has a really nice touch, in that the finish is surrounded by a clear plastic bubble. Clearly it's there to prevent you just starting the ball at the finish and claiming you're done, but it also serves as a focal point when the puzzle is solved. Since the start and finish are back to back with each other, it really finishes the puzzle nicely. If you have younger puzzlers who watched you play with the original, or you're looking to help with dexterity, this is a great item to have, and the kids will have problems putting it down. Amazon and Puzzle Master both carry the Perplexus line, so go on, pick up a copy! Come back tomorrow to see what I have to say about the Epic. Merry Christmas Neil. Thank you for a lovely little puzzle. Keep up the great work!